Google Brings Native Hindi Support For Android Phones! This is big – Google has now bought a completely Indian-ized version of Android. 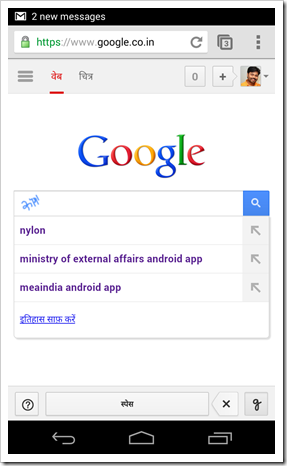 They have released a native hindi mobile search feature along with fully native Google interface for Android. India has a large English speaking population, infact it has 2nd largest number of english speaking people in the world. Yet, that represents only about 12 percent of the total population. Rest of the country converses mostly in Hindi or in their local language. Non-English speaking Mobile phone or smartphones users find it very difficult to operate and use their phones to maximum due to the language barrier. Google has taken a note of this and has now introduced 2 features that will make non-english speaking Indians very happy. Android users can now set their phones to do a hindi language search either by typing or by simply writing it with hands on the screen. We tried using the search, but I have to tell you, it was extremely difficult for us to really get it working correctly. I think the reason is because we had instant search activated. However, the issue is that you need to write very fast, otherwise the search box gets populated before the word is finished. The search function is still in beta and hence I think these problems may get sorted out. 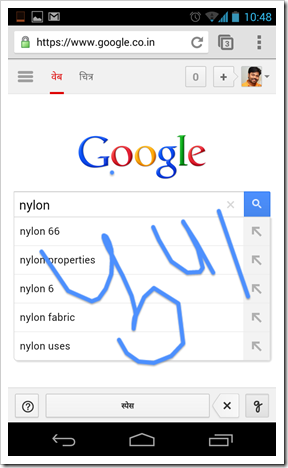 To activate Hindi search and handwriting, Android users will need to go to search settings and enable “Handwrite.” Users can also change language in all Google products to Hindi and add “Hindi” as a preferred language of Search Results. Android has now introduced a native hindi interface. I supposed this will be utilized a lot by Hindi speaking population. Users will just need to go to their phone settings and change the phone language to Hindi. Once that change is made, the entire phone language will change to Hindi. All the settings, menu items etc will show up in Hindi. While the hindi search feature still has some quirks, the full hindi interface seems excellent. Every menu (except for 3rd party apps menu) show up properly in hindi. Non-english speakers will no more have to struggle with English words they are not comfortable with. Even help files are well translated in hindi language. Along with these features, Google also launched a Chrome extension that will extend the hindi handwriting and search feature on your desktop browser. Google understands the importance of having local language on the web and mobile, especially in a country like India where English is understood by less than 15 percent of population. With these feature launches, they have now extended Android to the masses. I am sure we will see increased adoption of Android smartphones in the time to come. 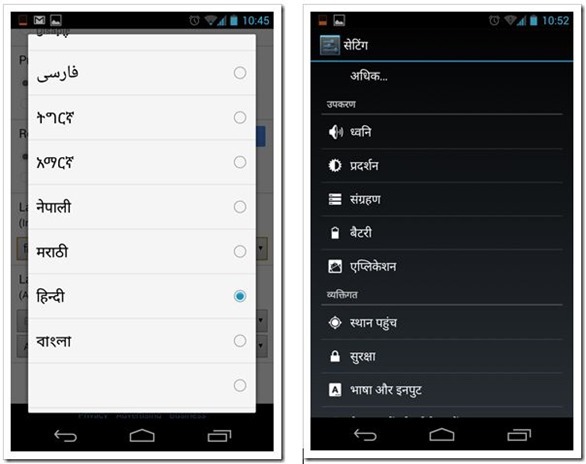 "Google Brings Native Hindi Support For Android Phones! ", 5 out of 5 based on 1 ratings.